Happy Friday, everyone! I’m coming off of 10 straight days with my mom having visited to help me with house projects and boy, did we get a lot done! I’m so proud of all she and Ryan were able to help me with. To honor our hard work, I’m dedicating this edition of The Friday 5 to a few favorite things about my kitchen space – including the transformation below! 1.Wood floors – I have ALWAYS wanted to have a kitchen with real wood flooring and have so enjoyed having original hardwoods in our new kitchen. It gives such depth and warmth to our space and I love the natural look that it gives. 2. Lots of natural light – this is the 5th kitchen I’ve had in the 5 years I’ve been married, and I have to say, it is the BEST I’ve had when it comes to natural light! There’s a huge double window at the end of the room and it casts such a cheery glow on the rest of the space. I’ve loved taking photos in this kitchen so far and can’t believe how good the light makes food look! I decided to put some crisp white Roman shades over the double window to create a soft diffused light and love the clean look of the shades. 3. 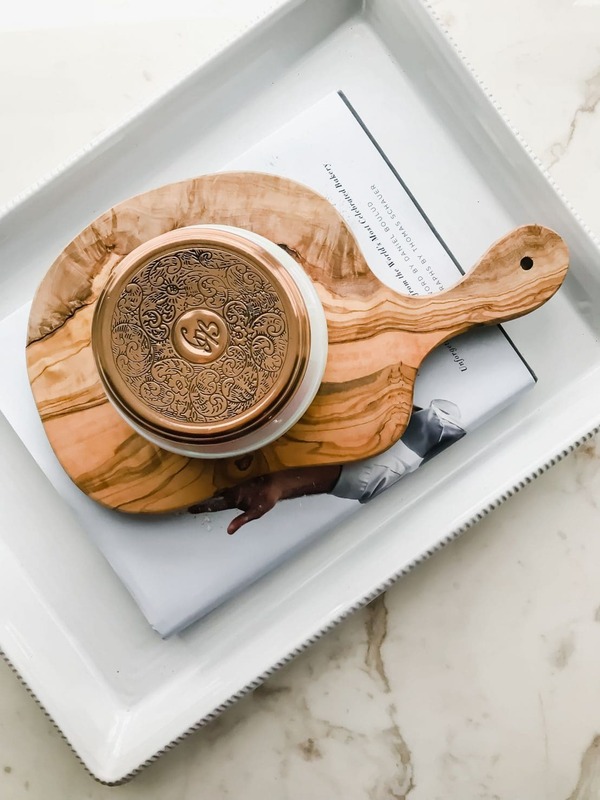 My marble top kitchen island – a kitchen island that would double as a photo background and table for making food videos has been on my wishlist for a while now. Although our kitchen is too small for a custom island in the center, we were still able to find a great solution in this marble top prep table from Joss and Main. I’m so in love with the black iron base and the fact that it looks like big French pastry prep table! 4. 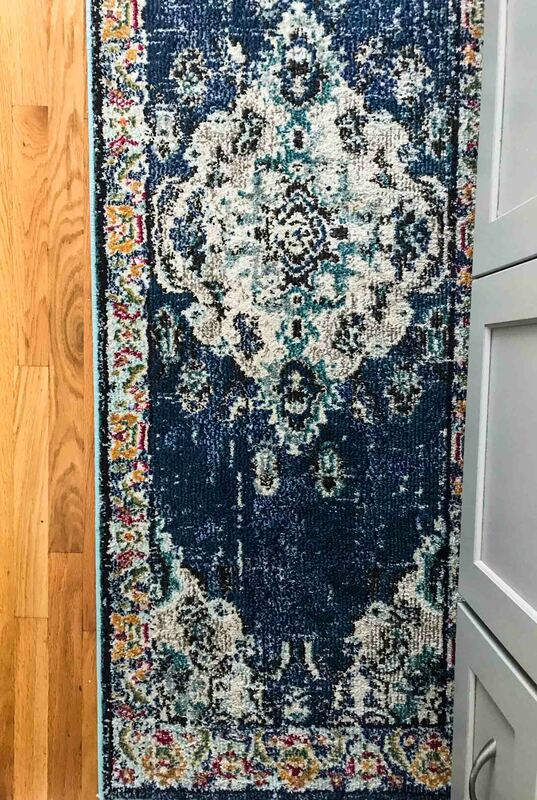 A long space for a vintage runner – after months of searching, I finally found the perfect vintage-style runner rug for my kitchen that added color and complimented the rest of the decor. And can I just say, I am OBSESSED with this rug! The colors in it match so perfectly with several of my kitchen items and serving pieces. It was definitely worth the wait to keep searching until I found just the right rug! 5. 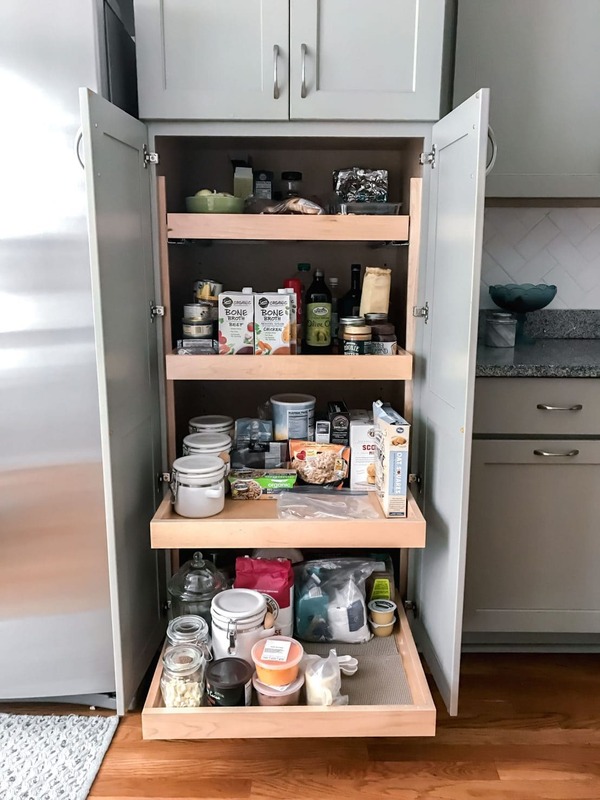 My deep pull-out shelf pantry – the kitchen in our new house looks very much like it was remodeled in the past 2 years or so. Because of this, we really didn’t feel like it was necessary to redo much in this space. One of my favorite features of the cabinetry is the pantry. The deep pull out shelving makes it SO easy to see what you have, clean the shelves, and keep things organized. I’ve never lived or worked in a kitchen with this feature before, and would highly recommend anyone who is remodeling to consider adding something like this! It has so much functionality. And there you have it! I don’t know about you, but little home tours are my favorite types of posts to read on other blogs. Let me know if this is a type of post you enjoy by leaving a comment below – I love and value any feedback I can get from you all! 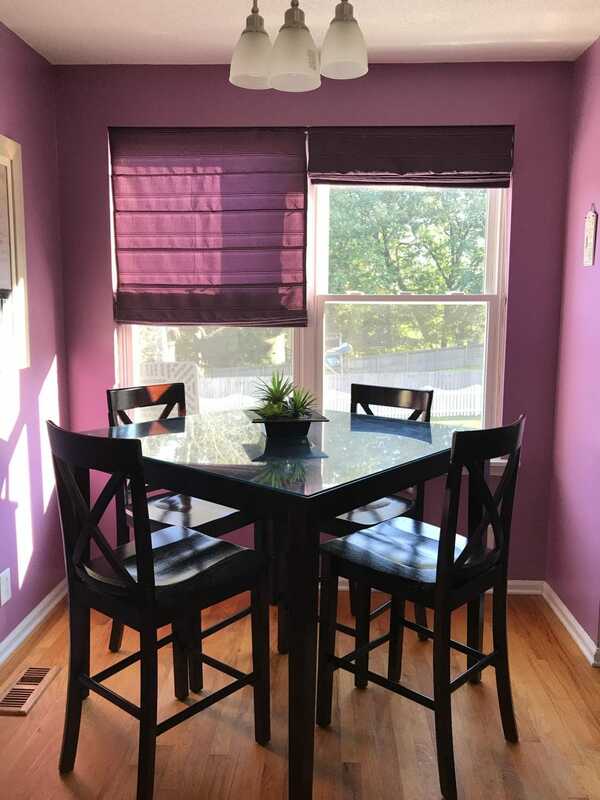 If this is a post you enjoyed, check out this post on a favorite color I’ve added to our home and this post to start getting ready for spring gardening! Have a great weekend, everyone! Previous Post: « Instant Pot First Impressions + Should I Buy An Instant Pot QUIZ! I enjoy your blogs, I see them on Facebook. I can’t believe the little girl that used to live in Newport, Arkansas has grown up and writing her own blog! You are quite accomplished! This is Ms. Phyllis Loftin [Worthington now], not sure if you remember Scott and Lindy Loftin’s mom. Hello there! Of course, I remember Mrs. Phyllis! I’ll never forget the little “Be Kind” t-shirt that you and Timothy made 🙂 Hope you are doing well – thank you for following along and the kind comment!